There are few in this world whose blood cannot be stirred by a simple tale of daring deeds. Diesels were always looked down upon in the extreme world of rallying. But at Mahindra, we had a different approach. The ‘Alternative Thinking’ – Super XUV500. A rally prepped XUV500, the first diesel Rally car to take on petrol sipping sedans and hatchbacks. We arrived in the TSD rallying scene bagging podium positions in all races be it the Raid De Himalaya, Desert Storm and Dakshin Dare. But this was not enough. We then took to tougher challenges participating in the extreme rallying category, the first being the Desert Storm in 2012 with two Super XUV500s. This set the ball rolling and we have never look back ever since. It has been around 7 years in the rally scene and now not only does Mahindra Adventure Rally Team participate and dominate extreme rally raids events but has also has dominated INRC (Indian National Rally Championship) and has emerged as champions two consecutive years in a row. The 2018 season saw both the Super XUV500s getting prepped in a new avatar, two freshly built cars with new livery to go with the season. 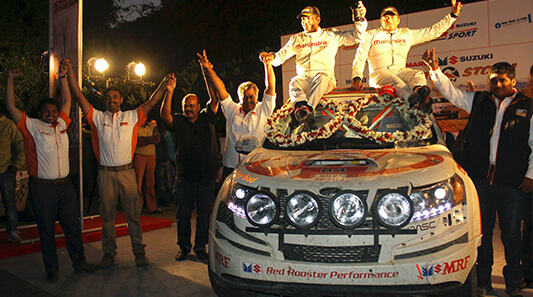 We dominated initial two rounds, South India Rally & Coimbatore Rally were comfortable victories for both of our drivers. Both the Super XUV500s finished 1st & 2nd on podium in both the rounds giving us a lead on the points chart. After a disappointing few rounds, it was all down to the final round. 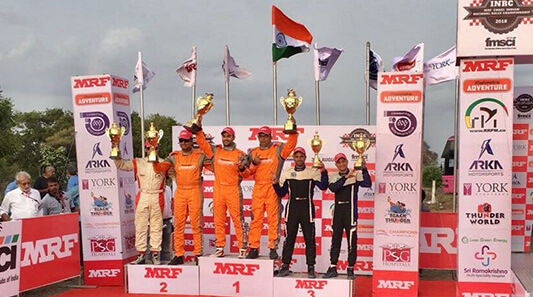 To win the driver's championship, ace duo of Gaurav Gill & Musa Sherif had to win. After three hard days of rallying, the moment came where everyone rejoiced to see Gaurav Gill's Super XUV500 crossing finish line to victory and to become INRC 2018 Champion. With the zest to be victorious again, our team put its best foot forward in 2017. 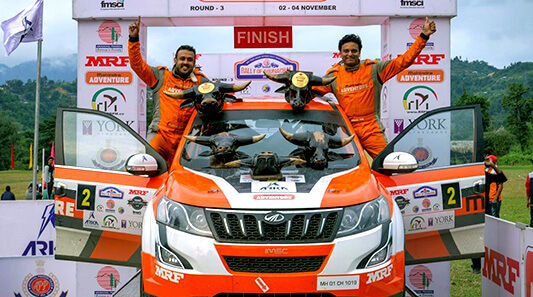 We also decided to go ahead with only 2 Super XUV500s piloted by Gaurav Gill/Musa Sherif and Amittrajit Ghosh/Ashwin Naik, the Super XUV500s made a successful comeback & won the Indian Rally Championship in 2017. The same year we reclaimed the constructor’s championship. The victory gave us a much-needed boost to maintain the winning consistency in coming year. 2016 was an interesting year for Mahindra Adventure. A lot of new players emerged in the INRC circuit, but this did not deter the teams hope. 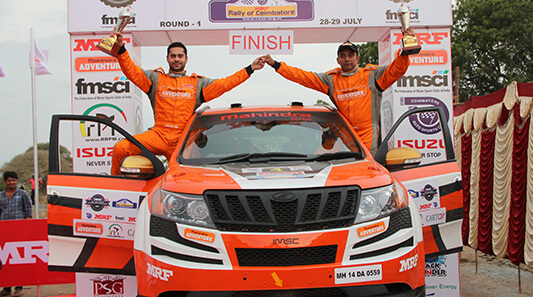 Mahindra Adventure Rally Team managed to bag the Constructor's championship but lost the Driver's championship merely by a single point. Being the champions always comes with a lot of expectations, 2015 was no different. Once again, we dominated the INRC circuit with our ace drivers and navigators to once again bag the INRC champions title. The 2014 rallying season began with a big bang for Mahindra Adventure! 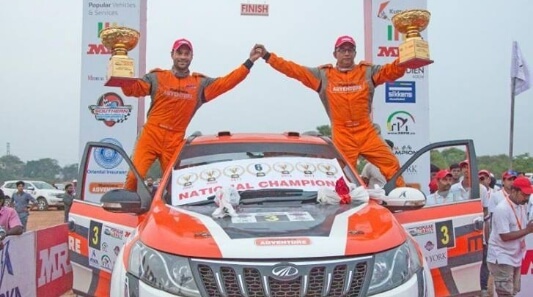 Sunny Sidhu piloted (with PVS Murthy as his navigator) the Super XUV500 and emerged as the Desert Storm winner. The Super XUV5OO created history at the historic endurance rally by being the first diesel SUV to win the Desert Storm rally. Mahindra Adventure has scooped up a new driver, ex INRC champion Amittrajit Ghosh along with navigator Ashwin Naik in 2014. 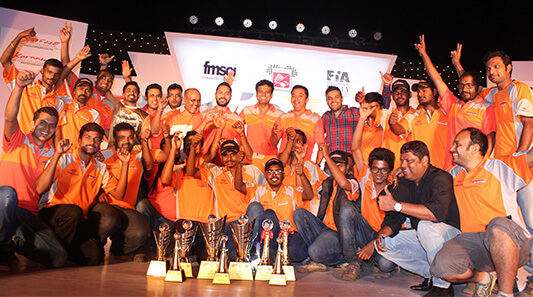 With 3 Super XUV500s and the best crew in the country, the Super XUV500s won the Indian Rally Championship 2014 season. After sealing the podium finish at Mughal Rally 2012, we were all ready to up the ante. In 2013, FMSCI invited Mahindra Adventure rally team to participate in the Indian National Rally Championship (INRC) to compete in the newly introduced Indian National SUV Rally Championship (INSUVRC) category. Gaurav Gill (with Musa Sherif as his navigator) piloting the Super XUV500 completely dominated the rally and was quicker than every other machine – all categories included. Team Mahindra Adventure emerged as the champions of INSUVRC, 2013! After dominating the TSD rally scene in the country, Mahindra Adventure took up the challenge of participating in extreme rallying category. Entered the Desert Storm Rally 2012 with two Super XUV500s. For handling such an extreme machine, we needed the country’s best driver-navigator combination behind the wheel of the Super XUV500s. So, we got Gaurav Gill & Musa Sheriff who were the winning duo of the Indian National Rally Championship and Lohitt Urs & PVS Murthy, the challengers of the INRC title. Bagging the podium on its debut, it was not only remembered as the biggest comeback in the history of Indian motorsport but also a modest first step by us into the world of extreme motorsports. 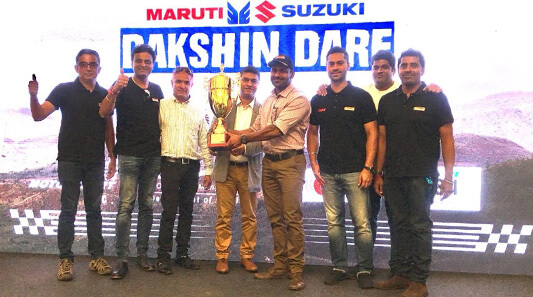 Then we hit the Dakshin Dare rally with a 1-2 podium finish which made our presence stronger amongst the motorsport fraternity. He is a six-time INRC champion & the top rally driver India has ever produced. At the age of 18, Gaurav was the youngest rallyist to have won the South India Rally 2000, his maiden rally. He was driving for team JK Tyres. He was runner-up in his first major break in 2003 at the National Road Racing Championship. The following year he notched up and finished first on the podium. Since then 32-year old Gaurav Gill has been on a speed track to becoming the finest rally champion India has churned out. The APRC 2016 Champion and multiple INRC Champion, Gaurav Gill is just unstoppable. What sets this driver apart is his involvement with the team that works on building his car. He understands the set-up of a car and therefore knows when to push and when not to. Over the years with international exposure and having driven so many cars, the one change he spots in himself is his attitude towards the sport. According to him, he uses aggression to his advantage. Everyone is looking to go faster. Someday somebody else will get faster than the champion. But, Gaurav has been increasing his pace with each rally to an extent where he'll have to keep setting his own speed limit. Not many people have watched the champion as he goes about his job as closely as Musa Sherif. He has been Gaurav’s navigator for seven long years and has watched him mature as a rally driver. Musa thinks Gill has an amazing memory that helps him remember each turn on every stage. Musa should know, as he is a pioneer when it comes to stage rallying with pace notes. They have participated in 53 rallies together & finished 37 of them & they have finished first a whopping 32 times. Having started his racing career on tarmac Amittrajit Ghosh quickly won many accolades. He was the National champion in Formula Car Category and the Touring Car category in 2005 and 2007, respectively. The rally bug bit him in 2008 when he finished on podium and then reserved a seat with Red Rooster Performance driving a Mitsubishi Cedia. Despite entering the thrilling world of Rallying, he did go back to racing on the tarmac whenever he got a chance. Ghosh, however has his feet firmly glued in INRC as he races against time and his team mate and arch-rival Gaurav Gill in his Super XUV5OO. Widely considered to be one of the finest navigators in the world of Indian Rallying, Ashwin started his career in 1995 on two wheels. He has won many trophies riding his motorcycle. Among the many notable achievements, Ashwin has so far participated in 175 rallies. From 2000 onwards Ashwin shifted to cars and since then has been a common sight on the podium for his navigating skills, not only in India, but internationally as well. Ashwin joined the Mahindra Adventure team in 2013 and has been co-driving Amittrajit for the last four years. The duo also finished second overall in 2016 & 2018 INRC championships.